Halloween is approaching and of course political costumes are all the rage this year. With 80 million people tuning into the debate, two of the most easily recognized Americans are Donald Trump and Hillary Clinton. So why not go as one of the two? The trickier part might be deciding which one. Unless you were a bully in high school or have oddly voluminous hair, the easier choice is Clinton. Check out these 11 easy Hillary Clinton costume ideas to make your Halloween great again — er, um... stronger together with the other fall holidays. There are plenty of reasons why you should costume "with her." She's had lots of iconic looks throughout her years in the public eye, and the Clinton campaign would even like to help you get there. On top of that, the GOP has had her on its most mocked, disparaged, you name it list for decades, so there were already a plethora of masks and accoutrement in production from her days as First Lady, Senator of New York, and Secretary of State. And though the GOP hasn't been her biggest admirer, those positions in the U.S. government have also won her a great deal of fans too. Plus, she's been rocking the styles of the decades since her days in elementary school, so your whole family could go as Clinton throughout the ages. Consider these easy ideas first, and good luck crafting your costume. So we'll start with the easiest ones first. There are lots of options on Amazon for a good rubber or latex mask. You might choose one based on how you feel about her as a candidate or person; some make her look great, others not so much. This one is kind of neutral, but there are definitely more and less flattering options. You may not be able to afford any suits quite as nice as Clinton's, but take a gander at your favorite stores for some sort of blazer and slacks combo. You might even be able to take this out of your closet. The upside is you can wear it again in your day-to-day life. If a pantsuit seems like too much work, you could get this T-shirt from the Clinton campaign online store. It's literally the easiest costume ever, and you're also supporting her campaign with the purchase. Did you read that about donating to her campaign with your purchase? Not your thing? Not to worry. This apparel option will only financially support Walmart. And it gets the message across loud and clear. People have said time and again that Obama has aged significantly since he arrived in the Oval Office. You could jump ahead a few years and show what Clinton might look like after a few years on the job. That's pretty much up to you, but buying some gray hair spray and putting on some makeup should do the job. The key to this costume is the easy "before" depiction. Carry around this life-size Clinton cutout with you. Clinton has been doing her best to smile these days, lest anyone accuse her of being cold or at a disconnect. Did you see those GIFs of her smiling and shimmying at the debate? Well if you can rock a smile, and maybe even a shimmy, the only other thing you'll need is this great wig. Pairing it with some dress clothes and pearls would help, but your shining mug is the real key. And while you're sporting the look, you should probably explain how the entire premise of "she should smile more" is both ridiculous and sexist. Florida's going to matter plenty this election season as the campaigns fight their way to a winning number in the Electoral College. Well, don't forget that this swing state's official moniker is "The Sunshine State." Consider a costume that doubles as shades to protect your eyes from UV rays, even in October. This one could be the easiest option ever. Remember back when everyone was all about Clinton? The Texts from Clinton memes combined with her mad Secretary of State skills were all the rage. Find that old blackberry, rock some big shades, and you're all set. Buy yourself a desk mic and carry it around with you. Make sure to keep up a really exasperated look on your face. Why are they asking you these questions again? This can be really easy. Break out your best pajamas, consider a wig if you have the budget. The key though is to get some old prescription bottles, some Vitamin C packets, and cough, cough, cough. 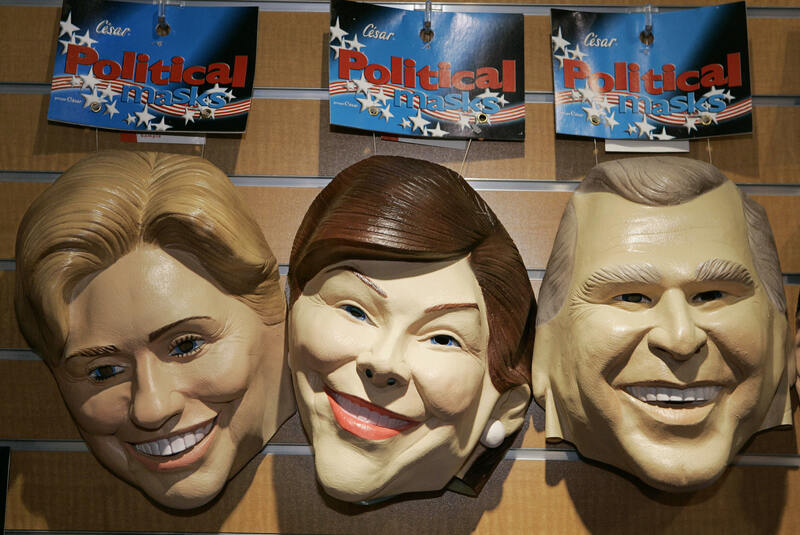 If you're reading this list and Halloween is already rolling around the corner, buy one of these masks on a stick. Or even print out your own if you have card stock and a Popsicle stick. If you can get a Clinton laugh going, this might really be convincing despite the ease of putting it together. Whatever the effort you can put into your look, just sell it — and don't forget to tell people to vote. That can be the upside of whatever combination of Clinton looks you rock this Oct. 31.